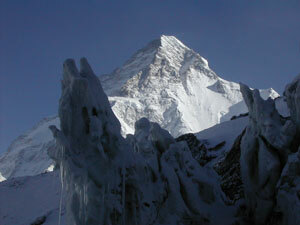 Chris has called in with an update from K2 where the team is now resting in preparation for a summit bid. Lakpa, Chris and the HAPs (Farhad, Aziz and Said) have now carried gear (rope, tents etc) and oxygen in C2 in preparation for a summit push this week. Everyone is back at BC with a rest day planned for August 1st. As it stands they plan to ascend to C2 on the 2nd, C3 on the 3rd, C4 on the 4th and then make a summit bid on the 5th. They are running into deep snow high on the route and this will represent a real challenge to establishing camp on the Shoulder in the days ahead so there will be a need for sharing the hard work to do. They are hopeful to make a bid on Friday the 5th and the weather will dictate this possibility. The predictions have been for calm summit winds for the 2nd to 5th but there looks now to be rising summit winds on the 5th so that window may close before they can make this push in which case they will hope for another window the following week. At this time FTA members Sophie, Rob and Lakpa will plan to make a summit bid with Chris planning to be in C2 in support during the bid. Farhad, Aziz and Said plan to deposit O2 and other gear in C4 and return to C3 on the 3rd. It is a real challenge for them to deliver these supplies to C4 and our success will depend a lot on how successful they are in their role. They have worked very hard for for our team on Broad Peak and have been a tremendous asset to the expedition as a whole. Chris notes that the group of climbers now assembled on the Cesen are largely familiar to each other and that they are cooperating very well. Among them are FTA alum Alex Txicon who became the youngest Basque climber to reach an 8000m summit in 2003 on Broad Peak. As well Bruno Buchet who was with FTA in 2005 on Broad Peak is on the hill and joining to push. Fabrizio and Kinga who had planned to climb a different route but have been forced by conditions back on to known ground. Christian, Gerfried and more round out the assembled group. Initially teams were to have been on up to three different routes but now all hopes lie in the Cesen from the Pakistan side. We'll have more news in the days ahead with the team's progress. After long deliberation about making a bid on G2, Wim has decide to come on out and not make the climb. He had hoped that some teams would still be on the hill and the route in reasonable shape but by the sounds of it G2 is becoming quite deserted and not a safe enough objective without others on the hill. He should be out in 3 days to Skardu and we'll let you know when he is out. The remainder of the team have all reached safely to Skardu and are on their way to Islamabad. They and all of us continue to have Jeff's loss very much affecting us and our thoughts are with Jeff's family and friends. 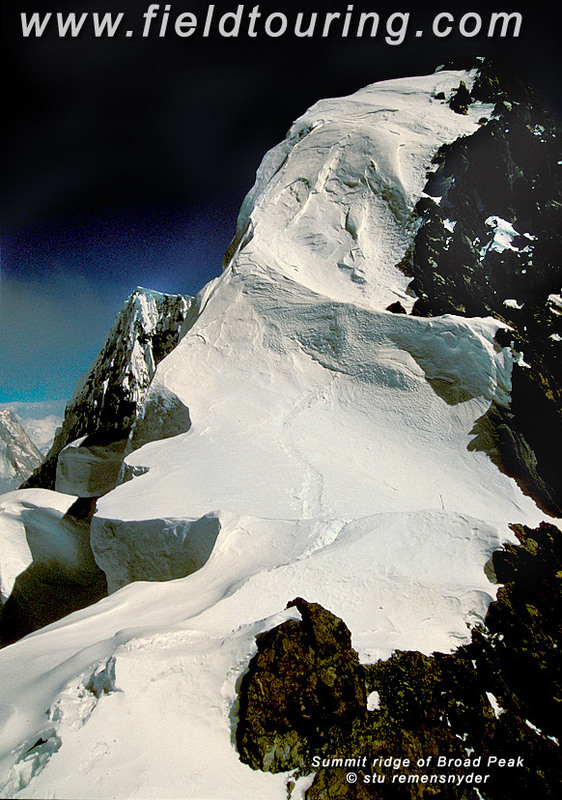 As many of you have heard we tragically lost a team member on the descent of Broad Peak. I am in pakistan now trying to assist in any way possible. 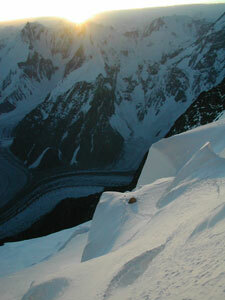 The main BP team have safely returned to Skardu, while Chris, Rob, Wim and Sophie have moved onto K2. I write this note with great sadness to share that just a short time after celebrating summit success we were met with a tragic fall of one of our team climbers. Yesterday after more than 12 hours of climbing our first member, Sophie, reached the summit and Wim and Andre followed a few hours later. Our HAP Farhad has broken trail for much of the way and without his effort it is hard to imagine they could have made the top. Farhad was some distance from the top when the three summiteers met him on their way down and they joined together for the main descent. Chris has called in from Broad Peak to let us know that three members have summited and that the entire summit team is headed back to C3. At the time of Chris's dispatch Sophie, Wim and Andre had made the summit and were working their way down. Further down below the col Mike was descending with Jeff who was quite tired. 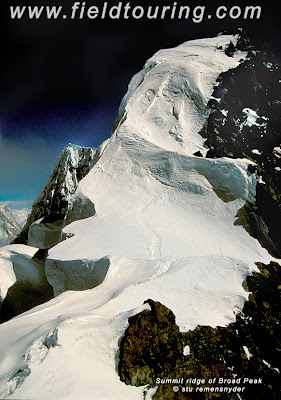 FTA K2/Broad Peak 2011 - Summit bid under way - team in C3! Broad Peak Update - Summit push is on! Chris has called in with the latest in the summit push and you can listen in below. The summit team is up in C3 and resting up, hydrating and eating as best they can in preparation for a 11pm/midnight departure. After a summer of high winds which have kept most teams grounded on Broad Peak or unable to climb much past C3 we have a good window over the next 24 hours with winds as low as 15-20 kmph and this will be the best chance for our team to place members high on the mountain. FTA K2/Broad Peak 2011 - Second round of acclimatization done...summit bids ahead! Chris has called in from BC to let us know that everyone is well and that most of team is in BC resting up for a summit bid. Sophie and Lakpa have remained high and are hoping for a break on Thursday in the winds to make a summit attempt. The remainder of the team is down at BC resting up for the next few days and then will hope for a good window perhaps around the 9th or 10th. The camp 4 that sometimes we establish is often placed on a small flat area at around 7500m and it is quite a spot! It can reduce the summit day by a few crucial hours and especially when the summit ridge is giving short windows of low wind this can be the small advantage making a summit bid possible. The views from C4 are spectacular but one rarely gets much sleep there between the altitude and the anticipation of leaving early for a summit bid. The sun comes onto the slope quite late in the morning so it is a very cold start and the ridge offers the first rays of warming sun. With summit winds to remain at or above 30km/hr Sophie and Lakpa will have their work cut out for them to make it to the top and back safely. 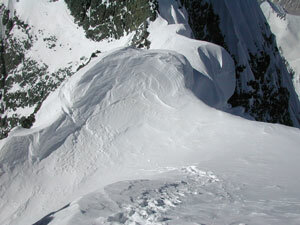 They will have to negotiate the summit ridge which is quite steep on both sides and offers little protection from wind. We have seen summits in winds like this before but they are very demanding and most parties will wait for a lower winds. As Chris says in his dispatch Lakpa and Sophie will try to thread the weather needle later this week so we wish a great window for them! 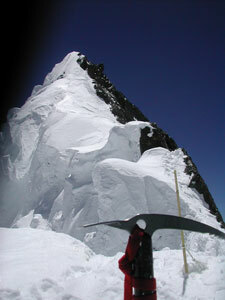 In the image below you can see the true summit of Broad Peak well back to the left and the rocky summit directly ahead. The distance between the rocky and true summits is some 900m with only a 12m rise. With calm winds this is a lot of work and in high winds a nearly unimaginable amount of effort. After reaching the top or a high point then one must negotiate a winding ridge back to the relative safety of the col at 7850m. From there it is a short rappel/downclimb to the main slopes leading back to high camp. This upper slope has a few narrow crevasses which must be negotiated. They can be hard to see from above and have been the site of at least a few serious accidents requiring evacs from high on the hill. After winding through the upper slopes it is finally back to the warm tent and a hot brew! We'll have more news shortly about any summit bids!